The 26th is nearly here and we're getting ready for the opening of the gallery. Ellie, Alison's granddaughter, will be officially opening the gallery for us at 2 and the gallery will be open from noon (45 Front Street, Prudhoe NE42 5DB). I look forward to raising a glass with you! 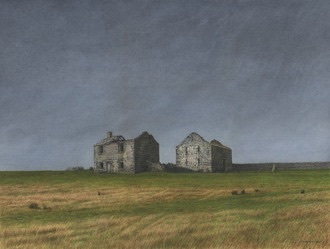 'Wall Fell Farm' is a painting of one of the many derelict farm buildings in Northumberland. Wall Fell Farm caught my eye from the Military Road, near Heaven's Field. I went to investigate it several times before it looked perfect to paint - one stormy, wet night when the light lit up the building. That's what I tried my best to capture. A window I'll be painting soon has a similar story. I visited an old farm on Sipton Shield, Allendale, in both autumn and spring. I'm torn between the spring view from the window, with blossom just starting to touch the branches, and the autumn view, when the branches were bowed with plums (which Alison and I picked and brought home). I think it'll be the autumn scene that I'll paint. Hope to see you in the gallery on the 26th. Welcome! Alison and I are now settled into the gallery and our home. The beautiful and celebrated Ellie, aged 3, Alison's dear granddaughter, will be officially opening the gallery for us on 26th March at 2pm and you are invited to come along. The gallery will be open from noon (45 Front Street, Prudhoe NE42 5DB). I very much hope to see you there.. I have also had good news from the Royal Watercolour Society this month. Please come along to celebrate the opening of my gallery with me - just mention this February blog as you come in. We decided to have Alison's granddaughter Ellie open the gallery as it is a family and friends celebration through and through. I would love to see you there. The Royal Watercolour Society have chosen my watercolour 'Shooting Lodge' to be exhibited in their 2016 exhibition. 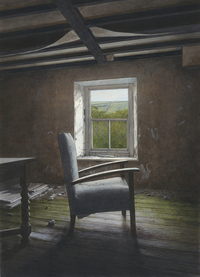 The shooting lodge is nestled in the fells, between Stanhope and Blanchland, and my painting will be exhibited in London from 4-16 March this year, so call in to see it if you're in the capital. Prints are for sale on my website. This is your invitation to join us here in the gallery at 45 Front Street, Prudhoe, on 27th November. Only one front room will be open, as we are still working on the rest of the gallery, but we are very keen to welcome you in. I will be there all day and into the evening. There will a real buzz around Prudhoe for the switching on of the lights, so please come along to say hello. Other major news is that China Radio International has taken an interest in my work and begun to promote me on their national radio station. I will be in the gallery all day on Friday 27th November to welcome you. The Spechells Christmas fair starts at 3pm and there will be craft stalls, Santa, face painting and a hog roast. The lights will be switched on at 6 and between 5 and 6 there will be complimentary mulled wine and mince pies from the Co-op - and Santa and crafts. I look forward to seeing you in the gallery. This is an exciting opportunity for me and I have been happy to supply the radio station with images of my paintings, a copy of my book and details of my career to date. This is a new experience for me and I am very much enjoying working with the radio station so far. While we are finishing off the gallery, the Jiggery Pokery in Mickley has kindly offered to stock my prints, paintings and books. It's a great place to browse, with a cafe, furniture, food counters, crafts, books, antiques and much more on hand to explore. Jacqui, who runs the cafe, food and furniture areas, chose a range of prints to show and two originals, so call in and browse if you are passing or eating there. This original watercolour comes with a gory and murderous story alongside of it. I waited 30 years to paint Belmount Farm - I needed to capture this gently crumbling building in the right light and weather conditions. Despite the adders I always saw in the grass when I called there, and the remote location near Huntstansworth, I am drawn to the building. It has an almost continental feel to it, and a warmth, and I can imagine myself living there. So I was surprised to read that on New Year's Day 1880, an extremely bloody murder took place there - the 'Blanchland Murder.' Robert Snowball, the master of the house, was hit in the head from behind, so brutally that his teeth were knocked out and the hammer was half embedded in his skull. No one was ever convicted of the murder, though his elderly father, housekeeper Jane Barron and her beau were all questioned. This shocking murder has left, for me, no residue of trauma in the building – and I was blissfully ignorant of all this at the time that I visited the house and as I was painting the watercolour. I feel it’s a peaceful painting and landscape, despite this bloody blot on the history of the house. Thursday 21st May 2015Teaching in Correze - Towers, A Locked Library and an Addams Family Window. Teaching in Correze held a few surprises for me this May. The teaching was the main purpose of the trip - my sixth visit to this beautiful area of France. Staying in the stunning Chateau de Beaufort is always good for a twist or two in the tale - in the shape of a 'secret' library this time. I find doors, windows and ... bread ovens in every corner when I travel - and this May, I found a couple of candidates! The primary reason for my visit was that I have a longstanding teaching arrangement in the village, La Roche Canillac. Kevan Myers, a British poet now living in France, is just one of a group of people in La Roche who is working hard to make this beautiful village an arts' magnet and my teaching is a part of that mission. My courses were well attended by French, Dutch, American and English students, I enjoyed working with them, and it’s possible I’ll be back there in August of this year. It was interesting that Kevan chose a painting of High Force to promote the watercolour course – an iconic Teesdale scene that is very dear to me personally. I was also lucky enough to meet the director of the Rive Gauche gallery in nearby Tulle who took a liking to my Northumbrian originals and took eight of them to display, and also some of my Indian prints. One of the highlights of my visit was that I got to stay in the stunning Chateau de Beaufort near to the salle polyvalente where I was teaching in La Roche. With a swimming pool, lake nearby and an almost secret, locked library in its tower, it was a superb place to stay in and to explore. 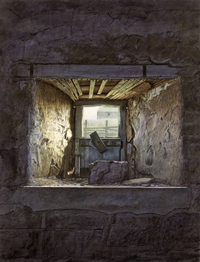 Another highlight was that I found two windows and a bread oven near to the village that would be perfect for me to paint, so I returned several times to get photographs of them at different times. 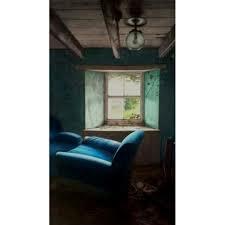 I never change the interiors I discover, but I do take many photographs to ensure that both colour and light are ripe to show the window, door or oven at its best. The bread oven has been used thousands of times by villagers, which has created a worn and wonderful patina I'd love to capture. And one window reminds me of the 1960s Addams Family TV series, it's so festooned in spiders’ webs. - a painting waiting to happen. Wonder if I’ll have captured it on paper by the time I return?